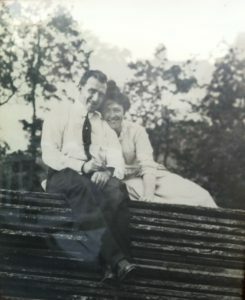 My great-grandparents, John and Catherine (Cassidy) Hampe. In a previous post – To catch a thief – I discussed the use of local clubs and societies in discovering information about ancestors. However, a recent acquisition led me to expand my search into religious records beyond the standard baptism, marriage, and burial records. A few months ago, my mother received several photographs and documents that had been in my grandparents’ possession before they died. One afternoon, while going through everything, I came across a certificate for a John A. Hampe written in German. As I have several ancestors named John Hampe, and do not read German, I had no idea what this document could be. I noticed a note on the back of the document, “Dad, 1898,” and determined that this document likely had to do with my great-grandfather, John Andrew Henry Mary Hampe, born in Boston on 5 December 1882, the father of my maternal grandmother. However, I was still unsure of what the document said. My attempts at translating the certificate using various websites didn’t really help, as some words would not translate. I took a picture of the certificate and showed it to fellow researcher Dan Sousa, who has a background in German. He informed me that the certificate indicated that my great-grandfather had joined a religious group, and one that appeared to be related to the Virgin Mary. 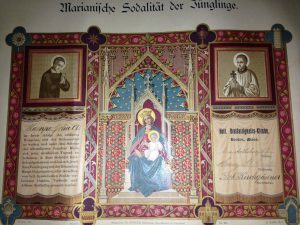 Wanting to learn more about this group, I looked into German churches in the Boston area. According to the website of the Archdiocese of Boston, which provides a list of churches organized by ethnicity, the only church affiliated with German immigrants in Boston is the Holy Trinity Church established in the South End. NEHGS has a variety of church histories for many regions of the United States, including an extensive collection of pertaining specifically to Boston churches. Fortunately, the library owns a copy of the history Holy Trinity German Catholic Church of Boston: A Way of Life, published in 1994. Members of the organization participated in a variety of causes, such as Catholic missions and charities, and debate and drama societies, and as members of sports clubs; they also held parties and socials. The church history contains a chapter devoted to the organizations associated with the church. According to the history, the Confraternity of Mary was founded shortly after the Holy Trinity Church was established in 1844, and open to all parishioners. By 1851, the confraternity had become so popular that it was broken up into several groups. In this split, a Young Men’s Sodality of Our Lady and the Young Women’s Sodality of Our Lady were created. In discussing this with Dan, he confirmed that the Young Men’s Sodality of Our Lady was very likely the organization my great-grandfather had joined as a teenager. Reading more about the Young Men’s Sodality of Our Lady, I was able to paint a fuller picture of my great-grandfather. Members of the organization participated in a variety of causes, such as Catholic missions and charities, and debate and drama societies, and as members of sports clubs; they also held parties and socials. 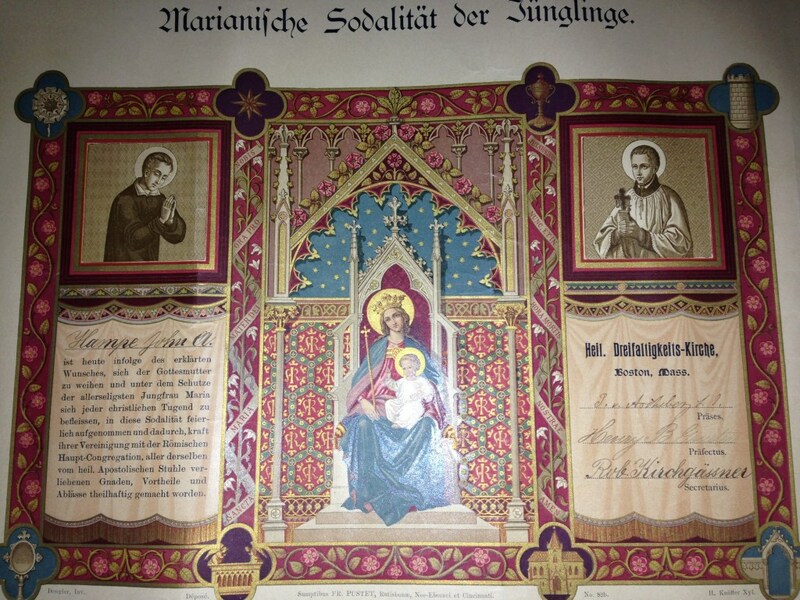 Though it is clear my great-grandfather was an active member of the Holy Trinity German Catholic Church in his youth, the church history does not indicate the length of his membership in the Young Men’s Sodality. Unfortunately, the Archdiocese of Boston does not contain parish records for Holy Trinity Church beyond baptisms, marriages, and deaths; however, records of the church are held at the New England Province of the Society of Jesus Archives, located at the College of the Holy Cross in Worcester. The finding aid for the collection includes financial records for the sodality beginning in the early 1900s, and it might be worth a trip to Worcester to learn what additional roles my great-grandfather may have played in the society, and the church, as a whole. Robert J. Sauer, Holy Trinity German Catholic Church of Boston: A Way of Life (Boston: Holy Trinity Church, c. 1994), 48. What a lovely photo of your great-grandparents. They seem so happy with each other. Background information is wonderful like this. I did the same thing with Kings Daughters. Learned there is a religious organization but more important to my research a French Canadian Historical group as well. Since my Grandmother was descended from French Canadians, what I thought was a fancy senile “following the stars” idea she had was not as senile as it seemed. I knew she was a member of the Kings Daughters, it put a whole new perspective on her life and loved her even more:)!